MyHeritage the leading global destination for family history and DNA testing, and the makers of the successful MyHeritage DNA product, announced the launch of its new and improved Ethnicity Estimate. The new analysis, developed by the company’s science team, provides MyHeritage DNA customers with a percentage-based estimate of their ethnic origins covering 42 ethnic regions, many available only on MyHeritage. It is the most comprehensive report of its type available on the market. MyHeritage is unique among the main industry players in allowing users who have tested their DNA with another service to upload – for free – their data to MyHeritage. Those users receive DNA Matches for free, for finding relatives based on shared DNA. Now, users who have already uploaded their DNA to MyHeritage, or who will do so in the coming months, will receive – for free – the new Ethnicity Estimate. No other major DNA company offers that. Development of the new Ethnicity Estimate raises the number of ethnic regions covered by MyHeritage DNA from 36 to 42. It was made possible thanks to MyHeritage’s Founder Populations project – one of the largest of its kind ever conducted. For this unique project, more than 5,000 participants were handpicked by MyHeritage from its 90 million strong user base, by virtue of their family tree exemplifying consistent ancestry from the same region or ethnicity for many generations. All project participants received complimentary DNA tests and allowed MyHeritage’s science team to develop breakthrough ethnicity models based on the generated data. 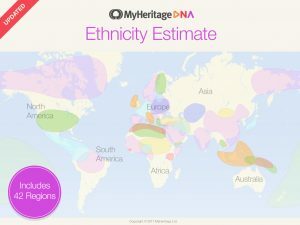 Thanks to the analysis, MyHeritage DNA has become the only mass-market percentage-based DNA test that reveals ethnicities such as Balkin; Baltic; Eskimo & Inuit; Japanese; Kenyan; Sierra Leonean; Somali; four major Jewish groups – Ethopian, Yemenite, Sephardic from North Africa and Mizrahi from Iran and Iraq; Indigenous Amazonian; Paupan and many others. In some cases, competing products can identify and report an aggregated region (e.g., Italian & Greek) whereas MyHeritage has better resolution and identifies Greek, Italian and Sardinian ethnicities separately. MyHeritage’s new Ethnicity Estimate is delivered to users via captivating “reveal” experience. It features animation and original music composed by MyHeritage. Each of the 42 ethnicities has a distinctive tune, based on the region’s cultural elements; all tunes seamlessly connect to each other. This makes the report fun to watch and share on social media. * MyHeritage DNA Matching is Now Live!